With Green Lantern #20 Geoff Johns has done for the Green Lantern mythos what Alan Moore did to Superman with Whatever Happened To The Man of Tomorrow? Told in a distant future through the frame story of a newly appointed Green Lantern wanting to hear the story of the final battle of The Dark Ages, this story - titled simply The End - marks the end not only of Johns' nine-year run on the main Green Lantern book but also the end of many of the innovations he brought about during that time. Backed by a team of several fine inkers, Doug Mahnke pencils most of this issue with his usual flare. 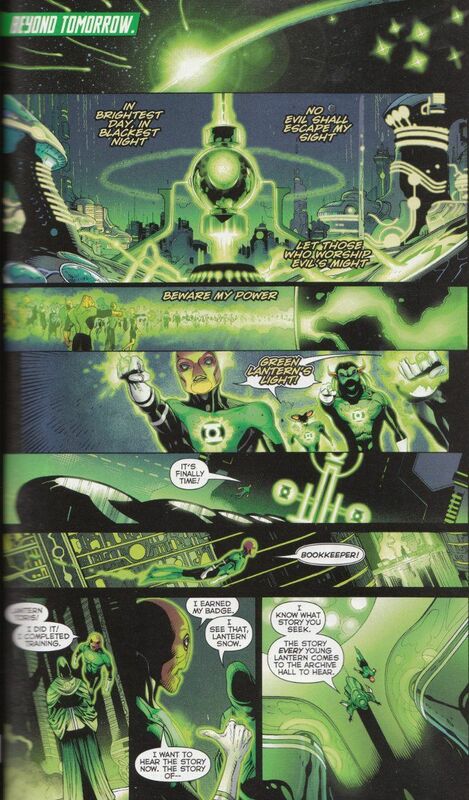 A large number of guest artists take up the art duties on the book's penultimate pages, which depict the final fates of most of the major players of the Green Lantern universe. Everything is beautiful and I have nothing further to add regarding the artwork. What more can I say? If the quartet of Green Lantern-related comics currently published by DC Comics were to cease publication forever after today, this would - for the most part - be a great way for the saga to end. For the most part? Yes, I do have a few complaints and here comes the part where I warn away any who do not wish any spoilers of this issue's story. So SPOILERS AHEAD! You have been warned. I have no complaints about the better part of the issue. Johns writes a space epic like nobody else and the brunt of this issue is devoted towards one heck of a cosmic battle. Damn near everyone in the series' history gets involved in the final fight with The First Lantern. There's even a few-fan favorite characters who show up that I don't think ever appeared during Johns' tenure, like G'Nort. My issues come with what comes before and what comes after the action of the issue. The beginning of the issue gives us a quick recounting of Hal's back-story, depicting his fall into madness, death and subsequent rebirth. Johns glosses over the details between Emerald Twilight and Rebirth, leading me to wonder if - in The New 52 reality - these events happened in a slightly different manner. 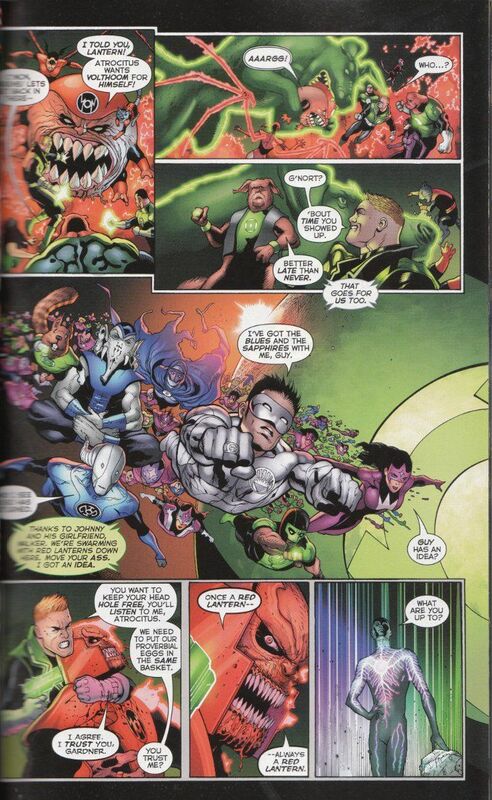 Both Grey Scherl and Russ Burlington discussed this problem and how it relates to Kyle Rayner's new background in greater detail on their respective sites, but the ultimate problem is the same. It feels a tad disingenuous to advise newer readers to pick-up Green Lantern: Rebirth in the back of this issue (along with the dozens of other books making up the Geoff Johns oeuvre) to see how it all began when it didn't really happen that way. My other problem with this story, ironically, deals with how certain things were spelled out and resolved. While some of the endings we see seem quite fitting (Guy Gardner's in particular is a hoot), there are some that appear to have been forced in order to give certain characters a happy ending even if it is one that doesn't seem to suit them. John Stewart's marriage to Fatality in particular seems incredibly forced, though I'm not sure if the blame for that lies with Johns or Green Lantern Corps writer Peter Tomasi. Still, the future is hardly written in stone. Nor, it seems, is the past. So while the Kyle Rayner fan in me is annoyed that Kyle apparently dies alone, content with having become DC's equivalent of Adam Warlock, I take comfort in the fact that what we see is not necessarily what will happen. And with the multiverse being what it is, odds are that my own idea of Kyle Rayner finding a way to bring back Alex DeWitt and retiring to teach elementary school art classes on Earth probably happens somewhere. Well done, Geoff Johns. Well done, indeed.